Our point of sales systems have successfully provided solutions to grocery stores and supermarkets all around Southern California from greater Los Angeles to Orange County. 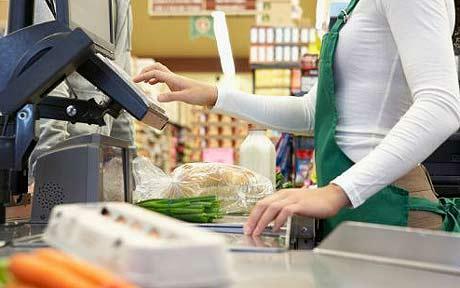 Our POS software systems were specifically built to improve overall efficiency for supermarket and grocery retail. Read below about the general benefits our grocery store Point of Sales systems offer to greater Los Angeles and Orange County businesses. Our grocery store POS technology works for businesses by providing supervision at the point of sale, and by recording data your accounting can rely on. These grocery retail systems introduce a sign in account and password for each cashier, which brings accountability to the work culture of your business. Our software systems also assist accounting workloads by providing traceability for each transaction through the all the data it records. Our grocery retail systems benefit both small and large operations because of these security benefits. Having the latest software system for grocery store businesses that offers you true operational efficiency is what Bridge SMS is about. Our point of sale system are modern and better suited for the inevitable advances in form of payment technologies. We only offer grocery POS with the latest system software with the latest updates. Businesses all around Southern California from greater Los Angeles to Orange County benefit from working with Bridge Solutions for their grocery retail POS system. Our systems are compatible with most credit/ debit readers, touchscreens, tablets, and more, offering versatility to suite your business needs. Businesses with efficient and customer friendly sale systems profit higher customer satisfaction, hence higher sales revenues. Our point of sale systems spur business growth. Supermarket and grocery store retail businesses from greater Los Angeles to Orange County find time to grow their sales once they have the best grocery POS system for their business. Bridge offers a system that is user friendly and reliable for its cashiers and its customers alike. Our modern grocery system software will record data of items purchased and the data of which customer is purchasing. Our clients have used these data reports towards an unlimited potentials of business growth. Business equipped with this kind of knowledge are able to initiate new marketing campaigns, rewards programs, and more. Our grocery store Point of Sale functionality is the difference that leads to business growth. We appreciate your visit to our company website. We’re based in Southern California and serve grocery retail businesses from greater Los Angeles to Orange County and beyond. Contact us directly and we’ll help with questions about the grocery POS your business needs.